Wow, where oh where have you been my old friend? 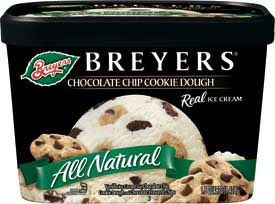 It's been awhile since I had Breyer's cookie dough where the base ice cream actually tasted like vanilla. I don't know what it was, but every container I bought seemed to be made with some sort of bleach white, bland substance. Yes, finally a batch that tastes like I remember. The base vanilla was actually off-white and tasted of vanilla to boot! Amazing! It wasn't perfect, but it was 20 times better than the last several containers.